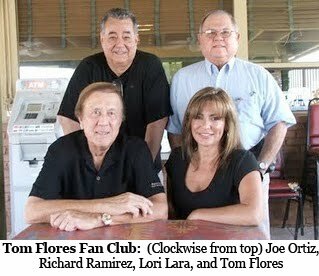 Tom Flores To Be Honored by National Council of La Raza. WASHINGTON, D.C. -- Tom Flores, the first Mexican American to play quarterback for a professional football team, will be honored on Tuesday, July 26, 2011, by the National Council of La Raza with its Roberto Clemente Sports Award. Flores, who has won four Super Bowl rings (as a player, assistant coach and twice as head coach of the Los Angeles and Oakland Raiders), will be presented the award at ceremonies being held in Washington D.C. on Tuesday, July 26, 2011. The event, which begins at 4:30 PM (Pacific time) will be streamed live from the National Council de La Raza web site as part of the organization's four day conference. 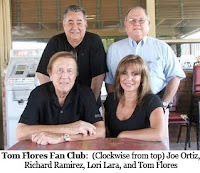 "The leadership team of the Official Tom Flores Fan Club, who nominated Tom Flores for the award, is extrememly proud and excited that Tom is being honored by this prestigious Latino organization," said Joe Ortiz, President of the fan club. "Tom Flores is one of the greatest examples and positive role models for Mexican Americans and other Latinos for the greatness he has achieved in professional football," added Ortiz. "Not only for excelling as a professional quarterback and Super Bowl winning head coach, but for his commitment to youth throughout the nation, especially as the founder of the Tom Flores Youth Foundation based out of his hometown of Sanger, California." Among his many honors, the football field of Sanger High School has been named the Tom Flores Stadium. Flores has also been inducted into the American Football League's Hall of Fame, as well as the California Sports Hall of Fame, and has been honored by many other institutions including the City of Los Angeles. "Tom has earned every commendation he has ever received," said Ortiz. "He has also earned the right to be inducted into the National Football League's Hall of Fame. All of his fans know this; it's only the voters of the Hall of Fame who have failed to acknowledge this reality and need to give him the honor he deserves." "My personal opinion is that when the Oakland Raiders came up with that great slogan for their football team, "A Committment to Excellence," they had to be thinking of Tom Flores," Ortiz beamed. Flores achievements are monumental, to say the least. He graduated from the University of the Pacific in 1958, but was unable to find a job in professional football. He was cut by the Calgary Stampeders of the CFL in 1958, and then by the Washington Redskins of the National Football League (NFL) in 1959. In 1960 Flores finally landed a position as a quarterback with the American Football League's Oakland Raiders, who began play in 1960 as a charter member of the league. Flores became the first Hispanic quarterback in American professional football. He became the Raiders' starting quarterback early in the 1960 season. Flores had his most productive season in 1966. Although he completed only 49.3 percent of his attempts, he passed for 2,638 yards and 24 touchdowns in 14 games. Oakland traded him to the Buffalo Bills in 1967. After serving primarily as a backup, he was released by the Bills and in 1969 signed with the Kansas City Chiefs, where he was back up to Len Dawson on the Chiefs' World Championship team, where he earned his first Super Bowl ring. He retired as a player after the 1970 season. He was one of only twenty players who were with the AFL for its entire ten-year existence. He is the fifth-leading passer, all-time, in the AFL. 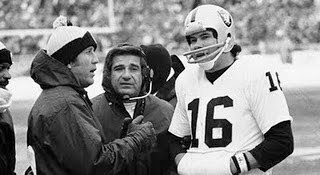 After stints as an assistant coach in Buffalo and Oakland (he won his 2nd Super Bowl XI ring as an Assistant Coach under John Madden), Flores became the Raiders' head coach in 1979, following John Madden's retirement. 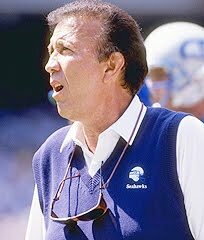 Flores then became the NFL's first minority (and Mexican American) head coach to win a Super Bowl, winning his third and fourth Super Bowl rings for Super Bowl XV and Super Bowl XVIII. After a 5-10 finish to the 1987 season, Flores moved to the Raiders' front office, but left after just one year to become the president and general manager of the Seattle Seahawks. He returned to coaching as the Seahawks head coach in 1992, but returned to the front office following three disappointing seasons. Flores resigned from the Seahawks in 1994 following Paul Allen's purchase of the Seahawks. Flores left Pro Football with a lifetime coaching record of 97-87 (52.7%), as well as an 8-3 playoff record, and with two Super Bowl victories. Flores, Jimmy Johnson, and George Seifert are the only eligible coaches with two such victories, who have not been selected to the Pro Football Hall of Fame. 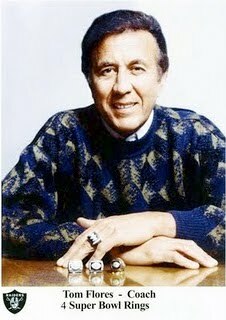 Tom Flores has distinguished himself in so many ways in the pro football arena as a player, assistant coach, head coach, President and General Manager of an NFL Football team, and now as a commentator for the Oakland Raiders football team along with Greg Papa on KSFO (560 AM) during the radio broadcasts of Raiders games. Maybe there are many other football players and coaches who have garnered more wins as a quarterback, or as an assistant coach or as a head coach, but very few professional football players and coaches (as well as fans) who have worked with Tom Flores among his many capacities in football or with numerous civic communities, can never say he isn't deserving to be inducted into the NFL's Hall of Fame! 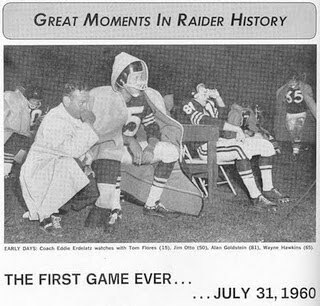 This coming July 31, 2011, Tom Flores will also celebrate 51 years involvment as a member of professional football community in the United States (not including high school, college and a stint in the Canadian Football League), where he became the first quarterback to play for the old American Football League as the quarterback for the embryonic Oakland Raiders. "I'm a Raider for life," said the iconic Flores.